“This inaugural Presidential awards for Travel and Tourism 2007, is aimed ‘to recognise and reward excellence’ among stakeholders of the past and present. It also aims to encourage and ensure an even greater contribution from its stakeholders in the future, to ensure the sustainable development of the tourism industry,” said Acting Secretary, Ministry of Tourism George Micheal. Based on an idea conceived by the Minister of Tourism Milinda Moragoda, Presidential awards for Travel and Tourism has been an initiative of Sri Lanka tourism. The panel of judges for the Presidential awards for Travel and Tourism consisted of Nalin Attygalle as Chairman, Dr. Hilary Cooray, Dr. L. N. Senaweera, Ambassador Nihal Rodrigo, Sujatha Weerakoon and Ganaka Amarasinghe. This year’s awards, consisted 44 awards, covering 11 industry segments acknowledged all aspects and sectors of the tourism industry in Sri Lanka. “It will also recognise individuals who have played a major role in meeting the many challenges the industry has faced, by sharing their vision and energy for the development of this great industry,” he said. He said that the event was a success. Prime Minister Ratnasiri Wickramanayake was the chief guest. Chairman, judges committee, Nalin Attygalle said though the response was good, he was dissappointed in the manner in which some top hoteliers had applied. “There was no professionalism in their applications which he discussed,” he said. John Keells Group was awarded five Presidential Awards for travel and tourism. Cinnamon Grand Colombo won two Presidential Tourism Awards, being adjudged the Best City Five Star Hotel and for having the best Restaurant, the Lagoon which is well know for its unique sea food concept. The John Keells Group’s commitment to Corporate Social Responsibility and sustainable development was reflected in the Presidential Corporate Social Responsibility Industry Award won by Chaaya Village Habarana for its contribution to the community. The award for the Best Effort in Tourism Marketing went to the launch campaign for Chaaya Hotels and Resorts. Kuoni Travel Ltd was the proud winner of Presidential Award for the Best Destination Loyal Partner - Foreign Tour Operator Category. The award was received by Whittall Boustead (Travel) Ltd the Destination Management Company of the John Keells Group who has represented Kuoni since 1993 in Sri Lanka. Cinnamon Grand Colombo was proud to win two prestigious Presidential Tourism Awards, being adjudged the Best City Five Star Hotel and for having the best Restaurant, the Lagoon which is well know for its unique sea food concept. This is a significant achievement for an indigenous brand that was born just two years ago and recognizes Cinnamon Grand’s unique brand of hospitality, service and cuisine. Winning against renowned international hotel chains, Cinnamon Grand is renowned not only for being the market leader in setting benchmarks and standards, but also in revolutionizing the very definition of hospitality in Sri Lanka with innovative features, products and services that conform to its theme of indulgence. The Deputy Chairman, John Keells Holdings and President Leisure Group, Ajit Gunewardene stated he was very proud of the achievements of the leisure group and reiterated the group’s commitment to continue to invest and grow this sector. He added that this is only the beginning as they forge ahead with new innovative and exciting projects and further expansion in Sri Lanka and Overseas. Confifi won two awards at the inaugural Presidential Awards for Travel & Tourism Excellence 2007 held recently at the Presidential Secretariat, when Confifi Group’s Riverina Hotel Beruwela and Club Palm Garden Hotel Beruwela were adjudged Sri Lanka’s best holiday resorts in their respective hotel categories. This was a fitting tribute to Confifi Group Hotels who have excelled in hospitality services since its inception in 1969 when the first Confifi Beach Hotel was built by present Chairman Prof. M.T.A. Furkhan who saw future potential in the islands tourism industry at a time when Tourism was relatively unknown in the destination. Through the last 37 years Confifi maintained this theme and again strategically spread their inviting hospitality to a diverse client base by building new hotels but each at a different level. Following the 2-star Confifi Beach Hotel, the 3-star Club Palm Garden was built in 1976, the 4-star Riverina Hotel was built in 1983 and the flagship 5-star Eden Resort & Spa opened its doors to guests in 1995, all on the coveted “golden mile” of beach in Beruwela. “Both resorts well deserve these accolades as they have consistently strived to maintain a high standard of hospitality and services to both foreign and local guests. This recognition at national level will go boost morale and confidence for the future amongst each and every staff member of both resorts who have been very ably led by their respective General Managers Chang Cey Wen at Riverina and Nilantha Rupasinghe at Club Palm Garden and the Directors of Confifi Management Services especially. Ajit Jayamanne - Director Operations - for his untiring efforts for their role to achieve the Awards” said Tony Maheswaran - Director/General Manager Sales and Marketing for Confifi Group Hotels. Sri Lanka’s most awarded hotel, Heritance Kandalama was awarded the Presidential Award for Best 5-Star Resort while Dimuthu Kumarasinghe, Skills Development Chef of the Aitken Spence Group won the award for the Best Chef at the Presidential Awards for Travel & Tourism Excellence 2007 held at the Presidential Secretariat. The Aitken Spence Group was the most awarded group at the Awards, bagging five awards including the Best Destination Management Company and Best Professional Conference Organization (PCO). 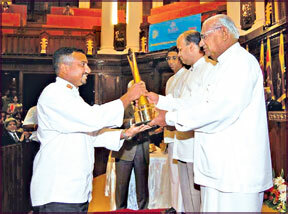 The group’s Skills Development Chef Dimuthu Kumarasinghe receiving the Presidential Award on behalf of Heritance Kandalama for the Best 5-Star Resort from Prime Minister Ratnasiri Wickramanayake. Heritance Kandalama has positioned Sri Lanka on the global tourism map with its recent recognition as one of the Top 15 Green Hotels of the World by the popular US-based Travel & Leisure magazine published by American Express Publishing Corporation. Designed by world-renowned architect Geoffrey Bawa, the hotel has also been recognized by the United Nations Global Compact Network Sri Lanka as one of the corporate sector’s top five best practices. The hotel is the first super brand hotel in Sri Lanka with ISO 22000 HACCP certification and ISO 14001 environmental certification. It is also a tourism symbol promoting Sri Lanka’s cultural heritage with its strategic setting amidst the UNESCO World Heritage Sites of Dambulla Cave Temple and the Sigiriya Rock Fortress. The group’s Skills Development Chef Dimuthu Kumarasinghe could probably be considered one of the world’s best chef, is a fitting winner of the Presidential Award. Dimuthu has on his list of unprecedented merits: a record nine gold medals at the Culinary World Cup 2006 in Luxembourg, four gold medals at the Culinary Olympics 2004 in Germany, and has been felicitated by the World Association of Cooks Societies for his achievements and contribution towards innovative culinary skills. He currently works at Heritance Ahungalla while passing on his skills to his peers within the group’s hotel as its Skills Development Chef. “This is yet another testament of our continued commitment to innovation and standards within our hotels and promoting Sri Lanka Tourism. Dimuthu’s achievement further testifies our investment in people and training. This recognition will further our commitment to positioning Sri Lanka as a world tourist destination”, said Malin Hapugoda, Managing Director of Aitken Spence Hotels. The Presidential Awards for Travel and Tourism Excellence was inaugurated by the Ministry of Tourism to foster competitiveness and uplift the standards of the local tourism and travel industry. The hotel was selected by an eminent panel of judges based on a comprehensive evaluation criterion comprising revenue generation, innovation, social, cultural, environmental and economic best practices, as well as its contribution as a role model for tourism excellence. General awards: Legends - 1. Late Dharmasiri Senanayake, 2. Late Ananda Tissa de Alwis, 3. Late Deshamanya Jeoffrey Bawa. Pioneer award - 1. Late A. C. H. de Soysa, 2. Late Mrs. Pearl Heenetigala, 3. Late Ms Mark Bostock, 4. Late Sudanapala Rodrigo. Best 5 star city hotel - Cinnamon Grand Colombo. Best 5 star resort: Kandalama Hotels Limited. Best 4 star hotel - Riverina Hotel. 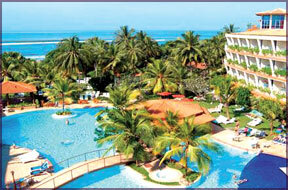 Best 2 star hotel - Club Palm Garden, Beruwala. Best Boutique Hotel - Saman Villas. Best Restaurant - The Lagoon. Airline: Best Charter Airline Operation - First Choice Airways. Tour Operator - Aitken Spence Travels. Domestic Tour Operator - Ebert Silva Touring Company. Conference Management Company - Ace Travels and Conventions. Tourism Marketing Communication Company - Masters Advertising. Media Initiative (Print) - Ms Delerine Munzeer. Ayurveda Based Tourism Operation - Barberyn Ayurveda Beach Resort. Adventure Tourism Operator - Lanka Sprotreizen. Best Tour Guide - Riza Badurdeen. Chauffer Guide - Ravindra Palagolla (Aitken Spence Travels. Chef - Dimuthu Kumarasinghe (Aitken Spence). Exceptional Individual - Dr. Publis Silva (Mount Lavinia Hotel). Corporate Social Responsibility (Industry) - Chaaya Village. Corporate Social Responsibility (Civil Society) - Ruhunu Tourist Bureau. Best Destination Loyal Partners (Foreign) - Tour Operator - Kouni Travel Limited. Journalist - Ms Sachiyo Iwase. Best Provincial Tourism Project: Provincial Destination Development and Marketing Initiative - Southern Provincial - Ruhunu Tourist Bureau.